(Nanowerk News) A nanotechnology breakthrough from DTU revolutionizes laser printing technology, allowing you to print high-resolution data and colour images of unprecedented quality and microscopic dimensions (Nature Nanotechnology, "Plasmonic colour laser printing"). 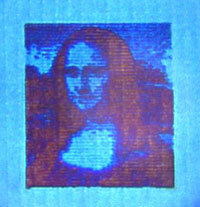 Researchers from DTU Nanotech and DTU Fotonik have succeeded in printing a microscopic Mona Lisa. She is 50 micrometres long or about 10,000 times smaller than the real Mona Lisa in the Louvre in Paris. Using this new technology, DTU researchers from DTU Nanotech and DTU Fotonik have reproduced a colour image of Mona Lisa which is less than one pixel on an iPhone Retina display. The laser technology allows printing in a mind-blowing resolution of 127,000 DPI. In comparison, weekly or monthly magazines are normally printed in a resolution equivalent to 300 DPI. Printing the microscopic images requires a special nanoscale-structured surface. The structure consists of rows with small columns with a diameter of merely 100 nanometres each. This structured surface is then covered by 20 nanometres of aluminium. When a laser pulse is transmitted from nanocolumn to nanocolumn, the nanocolumn is heated locally, after which it melts and is deformed. The temperature can reach up to 1,500°C, but only for a few nanoseconds, preventing the extreme heat from spreading. The intensity of the laser beam determines which colours are printed on the surface, since the extent of column deformation decides which colour is reflected. Low-intensity laser pulses lead to a minor deformation of the nanocolumn, resulting in blue and purple colour tone reflections. Strong laser pulses create a drastic deformation, which gives the reflection from the nanocolumn an orange and yellow colour tone. Professor N. Asger Mortensen from DTU Fotonik explains: "Every time you make a slight change to the column geometry, you change the way it absorbs light. The light which is not absorbed is the colour that our eyes see. If the column absorbs all the blue light, for example, the red light will remain, making the surface appear red." The DTU researchers believe that there is considerable scope for application of the new laser printing technology. Professor Anders Kristensen from DTU Nanotech elaborates: "It will be possible to save data invisible to the naked eye. This includes serial numbers or bar codes of products and other information. The technology can also be used to combat fraud and forgery, as the products will be labelled in way that makes them very difficult to reproduce. It will be easier to determine whether the product is an original or a copy." The new laser printing technology can also be used on a larger scale to personify products such as mobile phones with unique decorations, names, etc. Foreign companies producing parts for cars, such as instrument panels and buttons, are already taking a keen interest in the technology as it can simplify the production. Today, the large number of different instrument panels must be adapted to the various accessories that the car has, including airconditioning, USB, cigarette lighters, etc. The technology has been patented, and the researchers will now focus on developing the technology, so that it can replace the conventional laser printers that we have at our offices and in our homes.